Enamel (from the French. Email) - solid glassy coating applied to a metal base (steel, copper, silver, gold leaf), made with special inks on the basis of glass with the addition of various metal oxides and fixed by firing at a temperature of 780-900 degrees. Art jewelry enamel metal products came to Russia from Byzantium in the 10th century even simultaneously with the adoption of Christianity, and reached its perfection in Russia in XVI - XVII centuries. Art (hot), one of the oldest enamel ways to decorate metal. Enamel is used for the execution of miniature portraits, jewelry jewelry, icons, emblems and other luxury items. Art enamel at all times was valued at the level of precious stones, and today is recognized as the leading art historians as the painting of the XXI century. 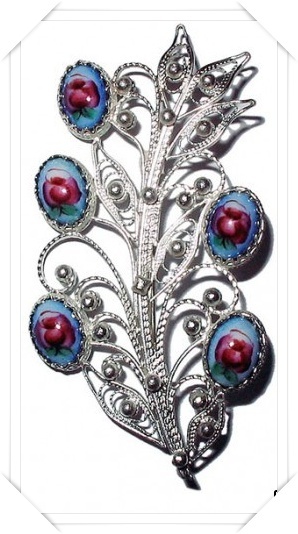 Rostov enamel has its own history and unique to her artistic features. Closely related to the arts and above all with the painting, whose influence is also evident in topics, and in terms of style, miniatures on enamel has played a significant role in the history of art and there was a quite original and independent of its form. 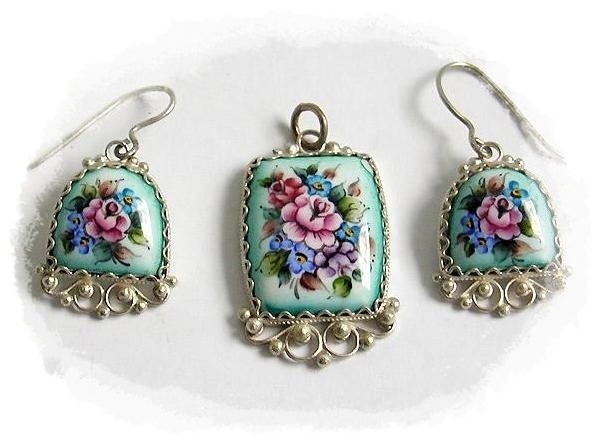 Elegant miniature painting on enamel blends with fine filigree. Filigree (filigree) - one of the oldest forms of artistic metalworking. Name Filigree comes from two Latin words - "phylum" (string) and "Granum" (grain). The word means filigree twist, twist. Stranded wire supplemented with grain (small balls) that make the product even more beautiful. Finiftevye jewelry (earrings, brooches, pendants, bracelets, rings) are beautiful and definitely unique. They were worn with evening gowns or costumes. These ornaments make elegant ladies, and attracted the attention of men, and at evening you will not be left unattended. Enamel love for subtlety, elegance, lightness and skill for people who create such beauty. Painting on enamel is close to the technique of painting on porcelain. On a thin convex plate, up to 1.5 mm is applied refractory enamel paints with t pl. from 700 to 800 0C plate is fired several times, with the color changing inks, as well as during the firing of porcelain. The enamel is applied to the front of the plate in three layers. After applying each layer of the plate is dried in an oven and fired in a muffle furnace at t 700-800 0C, while the enamel is not alloys, and the surface is smooth. To prevent the plate from possible deformation during firing in the process of painting, its flip side is covered with a layer of enamel, called "kontremalyu." In the first stage of painting on enamel with a fine brush is "underpainting" - primary colors are applied. After that, the plate is baked in a muffle furnace until the colors are not alloys and does not become bright and shiny. Extracted from the muffle plate is cooled, and should first residence, during which identifies the main details of the image, and chiaroscuro. Then the plate is re-dried, baked and cooled. During the second registration revealed minor details worked out the color tones and clarifies the relationship. Produces a third firing. When you create a simple composition using a limited color palette of painted finishes on the second or third stage. To write complex miniatures, rich color shades is required from 4 to 7 propisok and the same firing. This brief overview of the process of creating miniatures on enamel reveals the complexity and the complexity of manufacturing art enamels, which does not allow artists to create their enamel, in large quantities. Painting on enamel is almost never the same. Each piece individually with enamel. Therefore, enamel always been an elitist art form. Enamels are: notched (filling depressions in the metal), cloisonne (filling the gaps between the metallic ribbons, soldered to the surface of the metal edge), enamel on filigree (Russian enamel), a transparent enamel (with radiography through a layer of enamel, decorated with a relief or engraved metal surface) and enamel "guilloche" (Enamel over Guilloche) and painted (painting with colored enamel, as well as fire-resistant enamel paints on the surface). Famous Byzantine, Georgian, Russian, Chinese, French (Limoges), Enamel. To date, the technique of enamel art in Russia has more than 250 artists, but it was in Rostov Velikiy have developed a long tradition of painting on enamel, so it Rostov enamel is considered the best in Russia. Painting on enamel is almost always retains the purity, brilliance and color transparency. It is not exposed, like other kinds of painting, the devastating effects of such factors as light, temperature and moisture contamination. 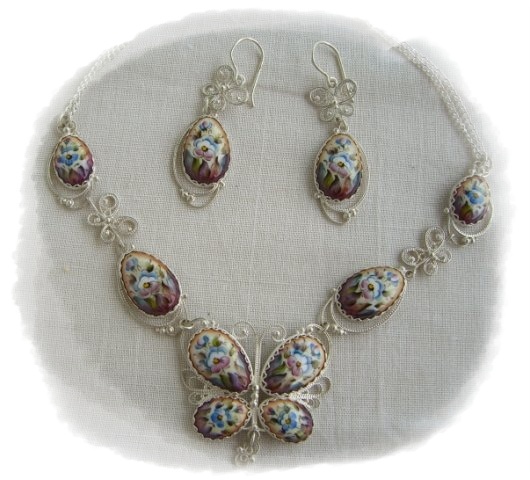 The completed form enamel, like jewelry, gives the frame, it is made a master goldsmith filigree. Filigree (from al-Rus. Slope - twine), filigree - the kind of jewelry techniques: an openwork or soldered onto a metal background pattern of fine gold, silver or copper wire, smooth or suite in the rope. Products from scanning are often supplemented with grain (small silver or gold beads) and enamel. Also on the site will find articles of art glass. People around the world are showing great interest in products made of glass. The glass figurines of animals, birds, floral arrangements, made St. Petersburg masters, attract attention and become the best gift because of its beauty and elegance of form.